Workout items that make staying fit on the road easier. For many business travelers, logging a lot of travel miles is synonymous with packing on the pounds. But it's the New Year and time for a new attitude toward fitness on the go. "It's not so difficult," says Joanne Lichten, a nutritionist and author of How to Stay Healthy & Fit on the Road. "It's starts with something as simple as walking whenever you can or packing healthy snacks like oatmeal and dehydrated soups." And maybe doing a little shopping. Here are some travel-friendly products we found to beef up your fitness kit and travel workout regimen. So, please, no excuses in 2010. 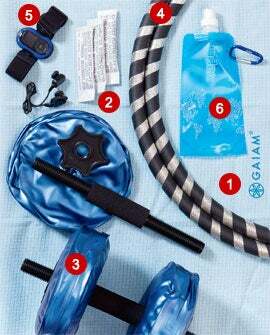 Weighing in at just 1 pound, Gaiam's compact travel mat folds up like a towel and easily fits in a carry-on. Lay it down on the floor (it grips) for a quick yoga fix, or if your hotel is swanky enough to offer fitness classes, layer it over a regular mat when you get your Vinyasa on. At less than $30, it's pretty affordable, too. When fitness guru David Kirsch (Heidi Klum, Naomi Campbell, etc.) introduced Thermo Bubbles a couple of years ago, stores couldn't restock fast enough. The supplement supposedly staves off hunger while boosting energy. Pour a packet ($39.99 for 10) into a bottle of water, drink up and ignore the doughnuts on the conference table. For $49.95, you can pack eight fillable dumbbells in your briefcase but tote less than 26 additional ounces. Fill them with water and you'll have up to 16 pounds of resistance to work with. BodyHoops' collapsible hula hoops trim your core while taking almost no space in your luggage. The "small" ($44.99) is plenty big and weighs just 2 pounds. A splash-proof MP3 with FM tuner, 1-gig storage, wireless headphones, stopwatch, pedometer, calorie counter and BMI calculator. It lists for $149.99 but sells for $30 at online retailers. It holds 16 ounces of water and rolls up to fit in a pocket. The bottle is reusable, washable and comes in a few colors. For $8.95, never throw away a plastic bottle in an airport again.